SACRAMENTO, Calif. (AP) Dwane Casey’s 500th career game as Toronto’s coach had plenty of moments to go sideways, especially after his team let a 15-point lead slip away in the first half. DeMar DeRozan’s decision to be more aggressive in the third quarter kept the Raptors on track and they extended their longest winning streak of the season. 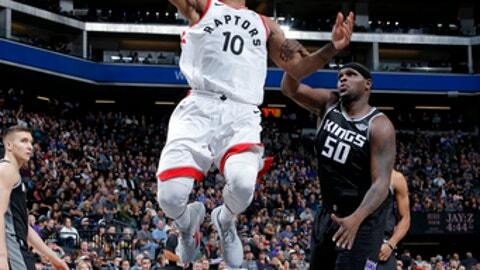 DeRozan scored 13 of his 25 points in the third quarter and Toronto held off the Sacramento Kings 102-87 on Sunday for its sixth straight victory. Kyle Lowry added 15 points, 12 rebounds and six assists on an off-night shooting, Serge Ibaka scored 20 points, and C.J. Miles had 11 for the Raptors. They won for the first time in Sacramento since 2014. That helped extend Toronto’s longest winning streak of the season and ended a four-game skid against Sacramento. Casey is the winningest coach in franchise history. The teams will meet again in Toronto next Sunday. Zach Randolph had 19 points and 11 rebounds for the Kings, and Buddy Hield added 17 points. Two days after an overtime road victory in New Orleans, Sacramento couldn’t sustain the momentum and dug a hole with eight turnovers in the first quarter. Toronto scored the first 13 points and led 17-2 on DeRozan’s short jumper four minutes into the first quarter. Sacramento committed 21 turnovers, leading to 27 points for Toronto. The six-game winning streak matches Toronto’s longest since it won 11 straight during the 2015-16 season. The Raptors had a pair of six-game streaks last season. Jakob Poeltl made his first career 3-pointer to open the fourth quarter for the Raptors. The ninth overall pick in 2016, Poeltl hadn’t even attempted a shot beyond the arc before Sunday. ”That’s what we do. That’s our secret weapon,” Lowry said. Raptors: Lowry shot 4 of 17 and was 3 of 12 beyond the arc. . It was the first time that DeRozan won a game in Sacramento. Kings: Hield scored 14 points in the first half on 6-of-8 shooting. … Bogdanovic started in place of George Hilll, who was out because of personal reasons. … Willie Cauley-Stein did not play because of a lingering sore back he initially hurt in Milwaukee on Dec. 2. … Sacramento had eight turnovers in the first quarter. Raptors: At the Los Angeles Clippers on Monday night. Kings: Host Phoenix on Tuesday night.